LONG LIFE FOR WASTE. A CHALLENGE AND A STIMULUS. We are talking about a pioneering plant in Spain of energy recovery of waste in S'Aranjassa, Mallorca, whose objective is the use of biomass, both forest and residual. Construction will begin this year, 2012. It was a question of developing facilities which would to allow the conversion of forest biomass into thermal energy and the later cogeneration of electricity from the residual part, both with the possibility of self-sufficiency or commercialization. We are not only developing the necessary facilities for this energy recovery, but we seek also to maximize their performance. 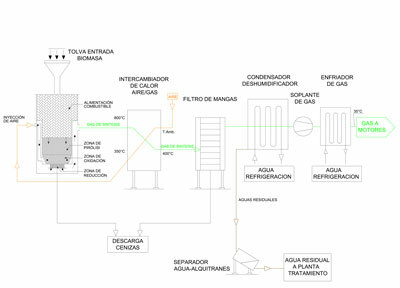 Through a process of gasification of biomass in combination with a Rankine cycle turbine we optimize the production of electrical energy. In addition, we are designing the utilization of the residual energies of the process. Result: improved performance of the plant. And less environmental impact.